Primary and secondary personas. And the extras! Are you using Design Research to align agendas within your organization? Succesvol herbestemmen van leegstand, zo doe je dat! Museum directeur; ken jij jouw bezoeker? What is the Service Design vocabulary? Idealize interview with Marcel Zwiers on "the human aspect"
De lokale bakker als Customer Experience Officier? "Wat betekent spelen voor jou?" The first Dutch Service Design book is here! Video: Wat is de Utrechtse Ontwerpstudio? What does a service designer do? Steun de India Pama stichting! Service design, a new design discipline. Petitie: ik wil een creatie/ideeën-coupe! What are the common Service Design pitfalls? Yoohoo! The Cat Cam is in! Where's the value in mobile advertising? Centre for Design Innovation, een voorbeeld voor Nederland! Inge Kuijper bespreekt "Service Design: A Review"
Design Thinking in the middle of a Financial crisis. Service Design Conference 2008. Zet het in je agenda! De Gezonde Leefomgeving, kun je die ontwerpen? Philips and NH Hoteles, user-centric or technology driven innovation? TrainSourcing: de trein als ultieme denktank? Hoe ontwerp je een concept voor een Innovatiecafe? Masterchef Goes Large; een concept voor de Nederlandse televisie? Je zei Service Design !? Beste architect, dit vinden wij belangrijk aan onze nieuwe school! Alexander Osterwalder, innoveren in je businessmodel! Creatief netwerken in Utrecht? Wie zijn we? Heel Nederland aan de QR Codes? Gezond gewicht: wie is Stefan en wat vindt hij belangrijk? When service could be inproved; stop complaining and do something! Event "What is meaningful to customers"
Open Workshop – QR Codes, wat heeft mijn klant er aan? Event "service innovation bij design"
Service Design Event met o.a Motorola, Yahoo, FEDEX. Etnografie en klantinteractie: hoe kopen klanten jouw diensten? De emotionele kijk op jouw klant, pak je voordeel! Betekent Google Maps het einde van Iens.nl en consorten? De Paarse krokodil met uitsterven bedreigd? Design your new service value proposition! Zo'n klein scherm, zo veel kansen! Obesitas en de Nederlandse Zorgverzekeraars. Obesitas, en de belevingswereld van onze jeugd. Nieuwe diensten ontwikkelen, ben je klaar voor de uitdaging? Publieksdiensten: ook op zaterdag "open"
Jaarcongres Publieke Dienstverlening 2007: de burger gelukkiger? Ga naar buiten! Kijk, daar fietst je klant. I-garage, transparante dientverlening is niet moeilijk! Tieners, de klant van morgen! Paradox in beeld : Nederlandse economie na GB meest dienstverleningsgebaseerd …..
Makelaarsland alweer op de schop? ‘How can physical spaces positively influence group creativity’. 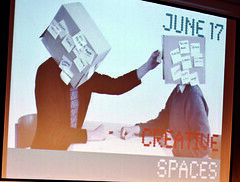 Recently I visited the third day of this symposium on Creative Spaces Design, at Utrecht University of Applied Science. My opinion is: do not emphasise on designing dedicated creative spaces. Do organise dedicated meetings with creative programs. Depending on and applied to each specific issue, a creative approach to space, time and means is required. Prime participants, get them out of their daily business en organise feedback on the (in)tangible results and take care of fruitful continuation of the program and meeting. Personal experience: after participating in LEF or the HU Concept Space several times, it’s becoming ‘normal’ or even disappointing because of high expectation not being met. (Expectations created for instance because of the high amount of effort, time, money and modern technology spent developing these spaces.) I was curious about the findings of the 2 day workshop preceding the symposium and about some of the speakers. Organiser and our friend Remko van der Lugt summarised the learnings of the 2 days workshops and excursions very briefly; some opportunities and some interesting fields of tension. (See moleskine notes below.) I think it is a challenge not to find and build the optimal point in these contrasts, but to keep them open to be adapted every time needed. Key-note speaker David Kirsh explained the support infrastructure for externalising ideas is very important. His quite inspiring example was a choreographer who sketches by dancing and making sounds, and the dancers copy and evolve the movements. I can’t imagine a space more personal, adaptable, creative, physical and virtual than the space made or taken with your own appearance, voice and body. The most energetic presentation was the interactive talk from the Creativity Company. After a warming up the audience was confronted with a picture of the most uninspiring boardroom ever. Statement: during a session space should be ‘noiseless’ (Dutch: ruisloos); shouldn’t take time or energy from the facilitator. (And participants, in my opinion.) Challenge was to come up with ideas to be able to transform this room into a creative space within one hour. Within 5 minutes we made the most fantastic plan, for me another proof that a creative approach is more important than a dedicated creative space. The symposium has strengthened my opinion that a creative approach is more important than creative spaces. 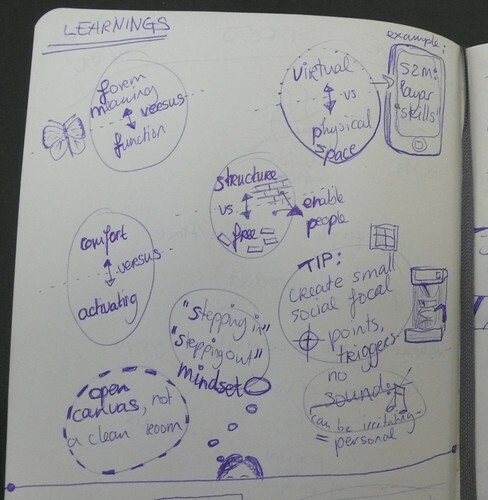 I heard some interesting ideas and details and can’t wait to test them in sessions or at my own living- or workspace. “Experts have tricks” (Kirsh) indeed and I think 31Volts is developing more and more professionalism in our creative and design approach, with our own strong but flexible processes and adaptable, accessible tools for any space. CreativeSpaces team, thanks for the organisation! At 31Volts we love people, design and innovation. Occasionally we take the time to share our thoughts on this blog. Like what you see? Let's get in touch! Nice writing! I am not yet up to the question of Jelle. It hangs – a long with four other learnings from csd10 – on my wall. My most important learning was about, as you describe it; the high expectations of designing such a special room. As someone in the audience phrased it, what does it says to your employees when you have something like a ‘creative room’. In my opinion, this supports the notion that we should try to enhance the level of all employees by whatever what means. thanks for your comment and additive learning. Upgrading the entire office building regarding creativity could be more motivating than a single dedicated room indeed. Good luck finding a PhD place, please keep us updated on your findings :-) and welcome to test our (almost white but creative) studio during a lunch! (lunch@31v.nl). Wil je op de hoogte blijven van interessante service design zaken? Meld je aan voor onze nieuwsbrief. Thanks, we'll be in touch!